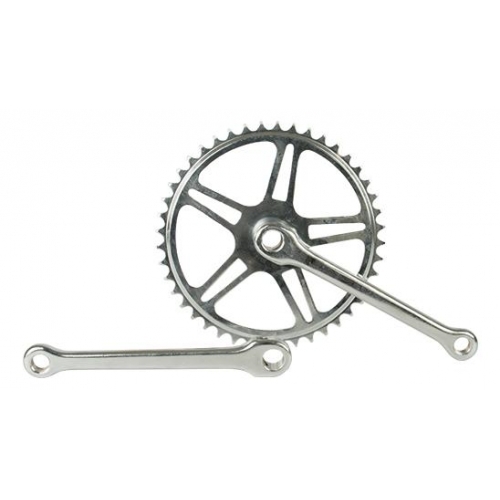 This single-speed crankset has chromed steel 170 mm long cranks, a 44 or 46 tooth chainring and is intended for use with 1/8th inch (single speed / hub gear) chains. 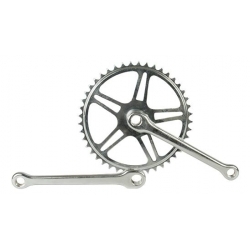 We have compatible chains and cartridge bottom brackets which work with this crankset. The required cotter pins are the most common 9.5 mm size (we sell these and other sizes). The 46 tooth size is most common. If you're struggling up hills or find that your pedalling cadence is often too low then opting for 44 teeth will give a slightly lower gear (or set of gears with a hub geared bike).